i’ve been making my way through nintendo’s various puzzle games, and wario’s woods is a game that i’ve had for a while on wii’s virtual console but have finally set aside. apparently the game was the last officially licensed NES title (and released on SNES less than a year later), and the presentation is pretty polished. the game is one of the only games that features mario series mainstay toad in a starring role, and for that reason alone gets a thumbs up from me. the game continues toad’s characterization from super mario bros. 2 (specifically, his super strength), and also features the return of a couple of other characters from that game, namely birdo and pidgey. regardless of the cameos, the gameplay itself is pretty solid. the game features bombs and enemies and is basically your typical match 3 (horizontally, vertically, or diagonally, with some pieces requiring you to remove them twice), although with some fairly novel mechanics. in the game you maneuver toad around the board. he can pick up any part of a stack (or a single piece from a stack), but is limited to where he can drop it. the game also alternates between two phases, one in which you have time to set up combos, and another that is more fast paced and is more about reacting. although they initially feel somewhat awkward, the controls work well and the gameplay is well balanced and well thought out. even after mastering the game’s mechanics the controls still feel a bit finicky, but the game is enjoyable overall. the focus of the game is on progressing through stages rather than racking up a high score, which is also a change of pace, and as with most puzzle games this game includes bonuses for chains and combos and a 2-player vs. mode. in my post about brain age: concentration training (for 3DS) i’d mentioned “blob blast”, an activity included as part of that game’s “relaxation” activities that’s a touch-screen based reworking of wario’s woods (see the official site for a video clip). the touchscreen controls of “blob blast” remove all of traces of awkwardness of the original, although as a result the game feels much less unique. wario’s woods feels a little rougher around the edges, but its mechanics are definitely much quirkier and give the game much more character, even beyond the presentation. 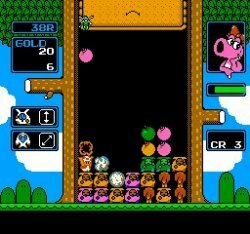 the game’s pace is much slower than the 3DS version in that there are 99 stages to work through (apparently the game includes a “round jump” function, which “saves your progress every fifth level and lets you jump back in later”) and the difficulty increases far too gradually (the game also allows you to accumulate continues by earning coins upon beating a level, with more coins given for faster times). as a result i found myself completely bored by round 51, and have set the game aside indefinitely (this is one of those games that, no doubt, greatly benefits from its 2P vs. mode). and although the game ostensibly features two single-player modes, the only difference is that in game B you encounter boss battles at regular intervals which are the same as regular levels except you have to remove pieces adjacent and in the same direction as a boss character that teleports around the board. overall the game is memorable and unique, and it’s definitely not the worst of nintendo’s many puzzle games. although it’s not a puzzle game for the ages, it’s still pretty fun and puzzle fans looking for something a bit different should enjoy it.